Windows has recently reentered the smartphone market full force with their new Windows Phone 7 operating system. 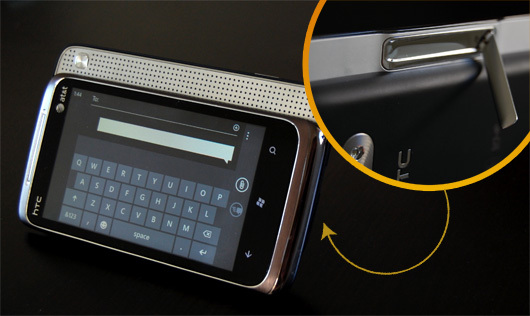 We got a hold of the HTC Surround and put WP7 to the test, resulting in the most detailed intro review of the platform yet. When Microsoft started advertising the Windows Phone 7, they called it the “phone that would save us from our phones” by getting us in and out and back to our lives with fewer distractions. While those commercials may have been trying to imply that Microsoft would re-invent the smartphone, it seems that in reality, Microsoft has re-invented itself in the mobile space. For the past few years, Windows Mobile has played a modest second fiddle to BlackBerry and Symbian in the corporate phone world. But now, Microsoft is shedding that cause and stepping more squarely into the ring currently occupied by Google and Apple with their respective mobile operating systems Android and iOS. For about four weeks, I set down my trusty iPhone and picked up a Windows Phone 7 to try it out. And after my review period, I can say that it’s a very good phone. But I can’t tell you for sure what kind of phone it is. Is it a web browsing phone for Internet junkies? Is it a social phone for the Facebook generation? A business phone for Microsoft users and workaholics? Is it a multimedia phone for audiophiles and shutterbugs? I think, if asked, I would answer each of those questions with a “yes.” But none of those yes answers are more resounding than the others. That could mean that the Windows Phone 7 is a smartphone with an identity crisis. Or it could mean that it’s a smartphone that does it all—almost. Either way, there’s a lot to cover here and I’ll try to give you my honest—though admittedly biased—reactions throughout. The Windows Phone 7 is a giant leap forward from their previous Windows Mobile platform (which left off at Windows Mobile 6.5). Previously, Windows Mobile 6.5 was a bit more like Android—it provided the backbone of the operating system, but it left manufacturers and carriers to tweak it, customize it and rejigger its look and feel as they saw fit. If you owned a Windows Mobile phone and you picked someone else’s up, you might not even recognize it as the same operating system as yours. That all changed with the Windows Phone 7, and I have to say, it was a good move. With WP7, Microsoft is partnering closely with manufacturers to ensure that it meets a number of hardware standards and delivers a similar user experience on every phone that runs their mobile OS. This standard list of features goes a long way towards making sure that all Windows Phone 7 experiences are up to par. In terms of speed, I found the Windows Phone 7 to be very smooth and responsive, especially in native apps. Third party apps sometimes drag, even those by big name developers. Games have particularly lengthy load times, but it’s completely justified once you see how beautiful and detailed they are. I also appreciated the standard physical buttons. I think the iPhone went a little overboard by only including the single function Home button. It took me awhile to figure out what to expect when I used the WP7’s Back button, but once I did, I really liked it. The Back button sends you back to the previous screen, even if it’s in a separate app. It’s the next best thing to multitasking, really, since you can quickly jump back to whatever you were just doing before you navigated away. The Search button pulls up the Bing search, which runs a web or news search or a location-based local search. From there, you’re just a few taps away from a web page or a Bing Local business listing and directions from your current location. In other places, the Search button pulls up a different search field. For example, in the Windows Marketplace, the Search button searches only the Marketplace. The Camera button is another worthy addition, helped along by the fast loading Camera app. Thanks to that button, you can grab snapshots before the moment passes, instead of fumbling clumsily through your home screen looking for the Camera app. With that being said, I do wish that you could wake the phone by touching the Home button or the volume buttons or any other button than the Power/Sleep button. I also wish there was a dedicated vibrate/ring switch, rather than having to push your volume all the way down or touch the ring/vibrate icon after waking the phone. I didn’t ever use the FM radio tuner. Partially because I couldn’t really figure out how to. I don’t think there’s a native app for it, and as far as I know, it only works with your headset plugged in. It would be cool to see some digital FM radio apps in the future, though, perhaps with the ability to pause/rewind and time shift programs. In theory, it’s pretty good. Windows Phone 7 is supposed to be the phone that gets you in and out and back to your life. To that end, it makes sense to have all your information right there on the Start screen presented in a way that’s visually consistent with the Metro design. But personally, I found the dynamic nature of the tiles distracting in some cases. For example, it once took me a full minute to find the Music + Video tile when the album art change unexpectedly. The way Windows Phone 7 occasionally mixes in random photos from your network of Facebook friends is even more unsettling—seeing pictures of your co-worker’s roommates cat doesn’t add much to the experience. The other issue is that there is only one Start screen that scrolls vertically forever and ever and ever. You can customize the layout of the tiles, but before long, you’ll have a cumbersomely immense list of tiles to hunt through—especially if you’re a compulsive app hoarder. The only other screen is a list of all applications and settings, presented as a list of icons and names in alphabetical order. That makes things a little easier, but it was hard not to feel like I was looking things up in a phonebook every time I had to mentally recite part of the alphabet in order to find Netflix or SlapDash Podcasts. A universal search feature would be really, really nice here. And with a dedicated search button already built-in, it doesn’t seem like it would be a problem to include it. I’d much rather type the first two letters of what I’m looking for and choose it from a short list than spend all day flicking through tiles. Many a third-party smartphone app developer has attempted to make mobile productivity a reality, but nothing beats the real thing. 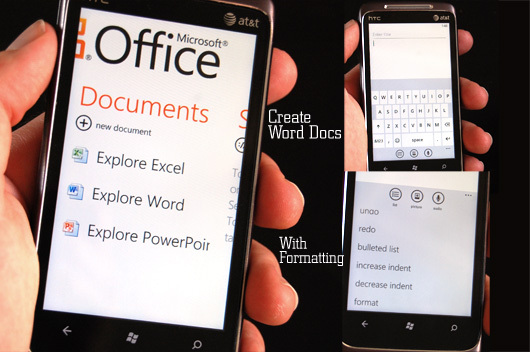 And with Office Mobile on the Windows Phone 7, you get it. Office Mobile lets you open, edit, save and share Word documents, Excel spreadsheets and OneNote notebooks and view PowerPoint presentations natively. Word allows you to do some light formatting, including highlighting and font color and bold, italics, underlines and strikethroughs. It even has spell check. Office Mobile puts a heavy emphasis on collaboration, with built-in support for Microsoft SharePoint servers and automatic syncing to your SkyDrive for your OneNote notebooks. All in all, the Windows Phone 7 lets you get some serious work done on the go without dealing with formatting inconsistencies and other oddities that crop up when third-party apps attempt to work with Microsoft Office files. 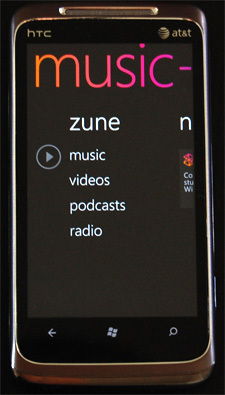 Just as the iPhone has a built-in iPod app, the music player in the Windows Phone 7 is like an integrated Zune HD. Syncing music, videos and other content to your phone is simple as plugging it in and dragging and dropping songs from your Zune collection. But what’s really cool is wireless sync, which lets you add songs to you phone via your wireless home network—no cables required. There are some limitations, though—the phone has to be plugged in with at least medium battery charge and not in use. But overall, it’s incredibly handy. I also really enjoyed my Zune Pass subscription. I’m the kind of guy who gets intensely obsessed with a band for a few weeks, which usually leads me to buying every single one of their releases. But 1 out of 5 times, I end up completely losing interest in the artist after a few months, leaving me nothing but a heap load of buyer’s remorse. As such, Zune Pass is perfect for me. It lets you download as many songs as you want from the Zune Marketplace and sync them to your computers and devices. You can play them in full quality an unlimited number of times until you stop paying for your subscription. However, every month you get to keep 10 DRM-free songs of your choosing. I had Zune Pass for two weeks for free and I loved it. I would’ve become a paying subscriber, but I switched back to my iPhone and at $14.95 a month, it came down to choosing between Zune Pass or Netflix on my monthly budget. The latter won. We’ve come a long way from the “Brick” game on the iPod, and the Windows Phone 7 is proof. 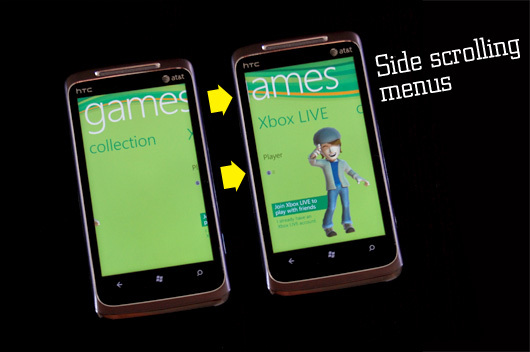 Many of the Windows Phone 7’s minimum hardware requirements work together to really make gaming on WP7 shine. From the 1 GHz processor and the DirectX9 GPU to the capacitive 4-point multi-touch screen, the Windows Phone 7 is a serious mobile gaming device, even without the much ballyhooed gyroscope that you’ll find in the iPod Touch and iPhone 4. The graphics are stunning, the controls are responsive and the performance is smooth. The games you’ll find in the Windows Marketplace come from big name game developers with recognizable titles such as Halo: Waypoint, Castlevania, Star Wars, Guitar Hero, The Sims and Earthworm Jim. In addition to the higher end games, there’s the usual fare of time-wasting mini-games as well—no Angry Birds yet, though. Microsoft also put considerable effort towards integrating your phone with your Xbox Live account. There are no head-to-head games as of yet, but you can certainly rack up your score and show off your avatar. As I mentioned above, Microsoft made a good move by imposing minimum standards on the camera’s functionality and performance. The camera software loads very, very quickly and the dedicated camera button makes it easy to pull it up. I also prefer the physical camera button to having to press a soft-key like on the BlackBerry Storm or the iPhone. The camera button is especially easy for people to figure out, say, if you hand them your phone and ask them to take a picture of you in front of the Grand Canyon. I could take the LED flash or leave it. When taking photos in my fairly dim basement, the flash just ended up making the subject blink and washing out the picture. The software’s built-in low-light adjustment works better, in my opinion. There are also a good number of settings you can tweak for the camcorder and for taking stills. All Windows Phones can shoot in 720p HD with digital zoom and have a noise-cancelling audio record option. The HD video was pretty impressive, but the auto-focus didn’t always know what I was trying to shoot. The built-in effects for stills and video are applied before the picture is taken. You can send the photo to another app—such as the HTC Photo Enhancer—for further tweaking. The Windows Phone 7 doesn’t have any main weaknesses, but there are a number of little things missing that have a significant cumulative impact on the overall experience. Many of these missing features are ones that are coming in the next update or sometime in the near, but undetermined future. The lack of copy and paste, for example, is a major downer, especially on a phone with such strong document editing features. Also, as mentioned above, there’s no universal search feature and no graceful way for filtering out your important contacts from your vast social media network (a “favorites” feature would be good). Overall, the mobile browser is very good. Pages load quickly and scrolling and zooming is intuitive and smooth. You can open up to six browser windows and switch between them using a very nice thumbnail-style switcher. But the mobile version of Internet Explorer really suffers on more than a few websites. Perhaps because the platform is so new, most of the web just feels like it’s not built for WP7. Most websites automatically detect your mobile browser and kick you to an optimized page for smartphones, but this happens less often with the Windows Phone 7 (i.e. on sites like Gmail). More often, you get to see the stripped down ugly version used for the previous generation of feature phones. Also, there’s currently no support for Flash. That’s true for the iPhone, too, but the difference is that the iPhone supports HTML5, which many major websites have adopted in order to accommodate the vast audiences who browse via iOS. WP7 also doesn’t support Silverlight as of now. Support for these application frameworks are likely to be added in the future, but for now, a large portion of the web is completely or partially off limits to Windows Phone 7 users. In terms of native support for accessing podcasts and streaming audio, there’s a real missed opportunity in the Windows Phone 7. The Marketplace doesn’t have a dedicated section for podcasts, nor does it have any easy way for you to download podcasts straight to your phone. There are a number of third-party apps that do the job, but they are a bit clunky. The awkward way that WP7 handles podcasts had me missing iTunes pretty fast. There’s also very little you can do to customize the look and feel of the Windows Phone 7. There’s only one home screen, and the only way you can tweak it is by changing it from a light to dark background or by changing the phone-wide accent color. You can also re-arrange the tiles. Beyond that, you can change the lock screen wallpaper and choose from a few pre-loaded alternate ring tones. But you can’t create custom ringtones or download ringtones from the Marketplace. On the HTC Surround I reviewed, the brightness controls were a bit insufficient. Instead of a slider for controlling brightness, there are four settings: low, medium, high and automatic. The low setting was too bright, especially when trying to use your phone in a darkened airplane cabin or bedroom without disturbing others. Currently, there seem to be very few menus and apps that support landscape views. This was particularly noticeable on the HTC Surround that I reviewed, since it has a kickstand that props it up in landscape mode. I found myself turning my head sideways more than I usually do when there’s no water stuck in my ear. There are additional little things like these that I kept coming across that were frustrating. I don’t like the way the phone information—such as connection, signal strength and battery life are hidden automatically. You have to touch near the top of the screen to pull them down, and even then, you don’t get to see a percentage for your battery life—just an icon with a graphic battery life meter. I also wish there was a way to seek within a song by dragging the playhead—currently, you can only rewind or fast forward. The way that WP7 handles contacts is unconventional, but perhaps forward-looking. The ideal user of a Windows Phone is someone who already has their life and contacts wired together via Windows Live and Facebook and regularly reaches out to their contacts via channels other than text or phone calls. Your contacts are all lumped together in your People hub, and the preferred method for getting them into your phone is by linking your online accounts—i.e. Facebook, Google, Hotmail, Microsoft Exchange or Outlook—and importing them from there. Facebook is a big part of Windows Phone 7, with an entire screen entitled “What’s New?” dedicated to it in the People hub. The “What’s New?” tab shows you status updates from your Facebook contacts and lets you like and comment on their items. On the one hand, it is kind of nice to have all your contacts’ email address, Facebook profiles and phone numbers pulled together into a single contact. In a way, it’s kind of like what Facebook Messages is trying to achieve. But there are some downsides. For example, by default, it pulls all of your Facebook friends into your People hub—even those you might never email, call or text in a million years. You can filter it down a bit, but the same goes for your Windows Live or Google accounts, where almost anyone you email becomes a contact. The result is a contacts list that is just way, way too long and makes life so much harder when you’re just trying to send your girlfriend a text to let her know that you’re stuck in traffic and will be late (actually, please don’t text and drive). You can pin individual contacts to the Start screen, which is kind of neat, since it shows their picture from Facebook (kind of like wallet photos 2.0), but if you have five or six people you contact regularly, it’s going to take up a lot of space on your Start screen. Lastly, it’s somewhat of a shock that there’s no Twitter integration. Twitter is even more mobile-centric than Facebook, but there’s no support for it in the People hub. Odd. There’s no unified inbox on the Windows Phone 7. Instead, all of your email addresses get their own tile. This is good and bad. For one, you get to see the unread count for each individual box right from the lock or Start screen. That way, if you see that you have a new email, but it’s in your personal account rather than your work account, you can safely ignore it. But it is kind of a pain that you have to hop around to each mailbox in order to check all of your mail—and I only have three email addresses. WP7 handles unread mail counts in an interesting way that I got used to pretty quickly. Instead of telling you straight up how many unread messages are in your inbox, the number next to the title corresponds to how many new messages have arrived since you last looked at your inbox. I like that. For some reason, it always puts me a bit at unease when my notification areas show that I have unread messages, even when I know what they are and I know that they aren’t immediately important. 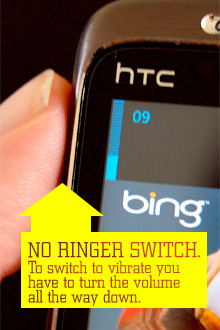 WP7 removes this subliminal distraction by only telling you when there are messages you didn’t know about before. You’ll get the most mileage out of your Windows Phone 7 if you have a Windows Live account. Many elements, such as your contacts, photos and documents, automatically sync to your Windows Live account, but only if you have a SkyDrive. You’ll also need a Windows Live account to play Xbox Live or access the Marketplace. I think Windows Live is excellent. The fact that it’s free already puts it head and shoulders above MobileMe. There’s great potential to live a very effective cloud-centric life thanks to Windows Live. You can edit, share and save documents on your home or work computer, access them via the web on a public computer or a friend’s computer and view, share and edit them from your phone, too. There’s virtually no situation where you wouldn’t have access to your stuff. And the best part is that it all syncs automatically—none of this dragging files around and worrying that you’re overwriting something newer. The only problem for me is that I am not a heavy Windows Live user. I keep my important documents organized with Dropbox and to some degree, Google Docs. Google’s mobile apps, which rely heavily on HTML5, don’t work very well on WP7 and there is no official Dropbox app. I know I already listed this as a strength, but after using the Windows Phone 7 for about a month, I’m going to have to say that I found the visual styling of the Windows Phone a bit overwhelming. Really, it’s kind of a departure from what I usually expect from Microsoft. I’m a guy who owns a Mac, but boots into Windows 7 because I prefer the clean, tidy, columns-based layout over the more freeform spatial, cascading workflow that usually happens in an OS X environment. But aside from the regimented tiles on the Start screen and the ludicrously long master list that you see when you swipe to the right, Windows Phone 7 feels a bit spacey. For example, within apps, hubs and settings screens with multiple columns or tabs, the header of the column ends up purposefully getting cut off. I know that this is supposed to make us infer a sense of fluidity, as if we’re just focused in on one small part of a bigger picture, but for me, it was a bit stressful—almost felt cluttered. The Zune player is also a bit ornate for me. The way that Zune pulls in album artwork and other photos of the artist is indeed very cool. The Music + Video hub will be populated with artist imagery from your play history, which is a nice touch—as long as you’re not listening to Xiu Xiu or someone who typically has disturbing liner notes and artwork. But all that space and imagery usually comes at the expense of textual information, which I prefer. Things like Zune’s rich artwork integration and iTune’s Coverflow look neat, but at the end of the day, I just want to find what I’m looking for fast. Overall, I really enjoyed the Windows Phone 7. While I was happy with the general functions, such as web browsing, taking pictures, emailing, using social media, texting, getting maps and directions and utilizing my favorite mobile apps (Yelp, Netflix, Foursquare, Kindle), I was very, very impressed by a handful of features (Zune Pass, the keyboard, Office Mobile) and let down by the lack of others (copy and paste, unified inbox, a good podcast interface). After my review period, I was happy to slide my SIM card back into my iPhone. But that doesn’t mean I wouldn’t recommend the Windows Phone 7 to someone based on their needs and preferences. Basically, the more Microsoft products you already use, the better your Windows Phone 7 experience will be. If you have an Xbox 360 and an Xbox Live account, a Microsoft Exchange email account and calendar, a Microsoft Sharepoint server, a Zune Pass and a Windows Live account with an active Skydrive, the Windows Phone 7 is going to make your life much easier. But if you spread your web services among Google, Apple, Yahoo, Microsoft and other online providers, a transition to WP7 could be a bit frustrating. And if you’re a Mac user, forget about it—they don’t even make Zune for OS X, and the Windows Phone 7 Connector for Mac is still in beta, and therefore a bit sketchy. I wouldn’t call the Windows Phone 7 an iPhone killer. I might not even call it a BlackBerry killer. I do think that non-power users who are overwhelmed by the somewhat amorphous nature of Android might find a Windows Phone 7 more intuitive and enjoyable, though. And I do think that the Windows Phone 7 is bound to get better as Microsoft rolls out more updates. I accidentally discovered this forum and I am glad to be here. This is a wonderful place for discussion and share your thoughts.all the information i got from this site is very interesting,I glad to I’m here,its really nice article…..! all the information i got from this site is very interesting,I read full story of this article,I think its very interesting…..! I can’t say that I’m impressed with any of the Windows Phone’s, but they are all decent. I just hoped that they would come with more impressive hardware. I’ve yet to check out the OS, so I my opinion of the phone could flip a 180…! I’m quite sure you can. I think after you shoot a video, you have the option to ‘share’ if you pull up the menu options. You know, the thing on the bar that goes : …! Well the current WP 7 OS can’t compete with iOS and Android OS at all. However, Microsoft has promised to release the next OS version with many must-have features like Multitasking, Copy-Paste etc etc and if it happens and the company keep bringing innovation in upcoming firmware versions, it might compete with others. But it seems very difficult…! 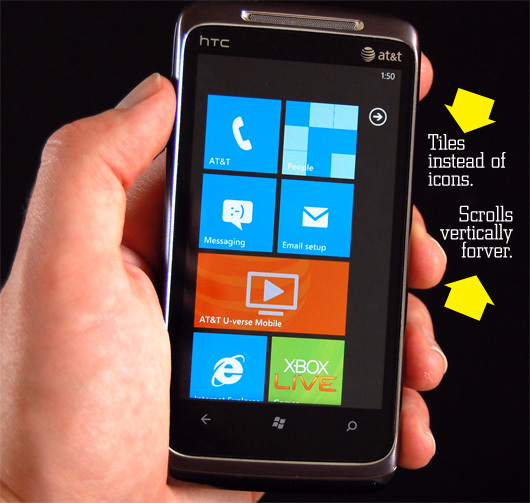 All windows phone 7 phones REQUIRE touch screens and all do have touch screens. when you say some HTC phones dont have touch screens your talking about older Windows mobile versions like 6.5 and sub. all the Windows PHONE 7 phones have the same compatability with X Live. but the older phones do not have access at all. And its also not an XBOX app, it just allows you to basically review your achievements..